Trimble Catalyst software-defined GNSS receiver for Android devices. Photo source: Trimble. Trimble just announced that its Trimble Catalyst software-defined GNSS receiver for Android devices is now available through the company’s global distribution network. Customers can now access Positioning-as-a-Service to collect geo-location data with Trimble or third-party apps on smartphones, tablets and mobile handhelds. 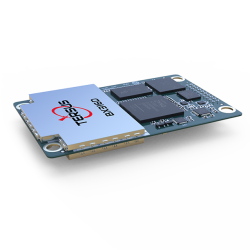 When combined with a small, lightweight, plug-and-play digital antenna and subscription to the Catalyst service, the receiver provides on-demand GNSS positioning capabilities to transform consumer devices into centimeter-accurate mobile data collection systems. "Our goal has always been to extend the accessibility of high-accuracy positioning to a broader base of geospatial and non-geospatial professionals," said Ron Bisio, vice president of Trimble Geospatial. "Trimble Catalyst represents a new era of GNSS technology by making high-precision positioning a reality for new user segments around the world. With economical on-demand service, it puts high-accuracy in the palm of anyone’s hand — it’s revolutionary." The Trimble Catalyst solution includes a software development kit (SDK) for building mobile applications with integrated professional workflows. Both Trimble and third-party development teams have produced a range of Catalyst-enabled applications for Geographic Information System (GIS) data acquisition, cadastral land management, topographic mapping, and ground control for unmanned aircraft systems (UAVs). "Trimble is enabling us to deliver better solutions for our customers thanks to the level of integration that the SDK provides," said Paul Brodin of Korec Group. "It allows us to provide sophisticated solutions that are innovative, easy to use and remove the technical complexity associated with high-accuracy workflows." Trimble Catalyst service subscriptions and the Catalyst DA1 antenna are now available through Trimble’s Authorized GIS Distribution Network. These distributors can be found by visiting: http://catalyst.trimble.com/ShopNow. Catalyst availability, pricing, subscription and accuracy may vary by region. Catalyst-enabled apps for Android can be found in the Google Play Store.